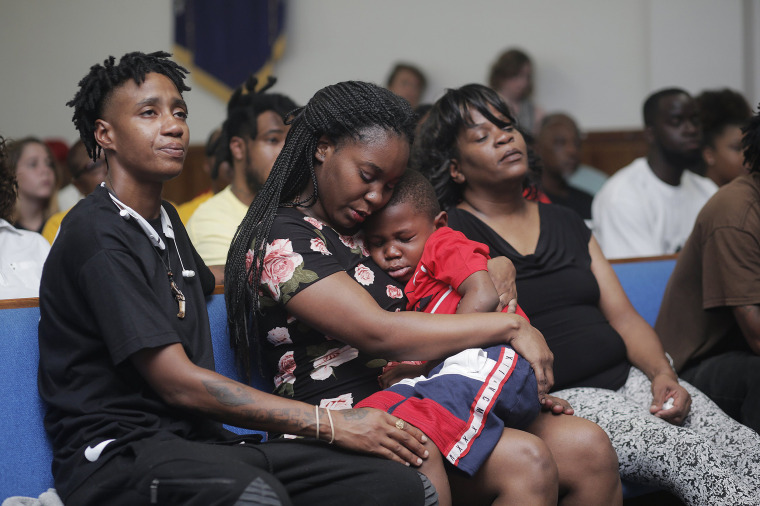 An attorney representing the family of slain man Markeis McGlockton said they want the shooter charged, and "if not, they're sanctioning a murder." An attorney representing the family of a black man who was fatally shot by a white man in Florida said they want the shooter charged — despite Florida's controversial "stand your ground" laws, which police said prevented them from even making an arrest. "He was there for his kids, and he didn’t have to go like this," said Britany Jacobs, the girlfriend of Markeis McGlockton, 28, who was fatally shot after pushing Michael Drejka to the ground during an altercation over a handicapped-parking spot in Clearwater on Thursday afternoon. Jacobs said of Drejka was the aggressor — "this man came to me." "I don't know this man, I don't know this man at all, and Markeis did not know this man at all," she said. "And all he was trying to do was protect what was his, and that was his family and that was his kids." Pinellas County Sheriff Bob Gualtieri has said that video of the shooting appeared to show Drejka, 47, defending himself and that the "stand your ground" law precluded authorities from arresting him. "No matter how you slice it or dice it, that was a violent push to the ground," the sheriff said in the days after the incident. Gualtieri said that it would be up to the local prosecutors to determine whether Drejka was "not entitled to use force in this circumstance." Michele Rayner, the attorney representing McGlockton’s family, said Tuesday that they want Pinellas County State's Attorney Bernie McCabe’s office to charge Drejka. "This case is not a stand your ground case," said Rayner. "Mr. McGlockton, he shoved Mr. Drejka. He shoved him because he was advancing on Ms. Jacobs, he was advancing on the vehicle," Rayner said. "And he shoved him to protect her, and two of his three children that were in the vehicle at that time." "There was no imminent danger that Mr. Drejka was going to die. There was no weapon that was brandished. Mr. McGlockton was not armed," she said. A spokesperson for the state’s attorney’s office could not be reached after business hours Tuesday evening. Earlier this week the office said it had no update in the case. Drejka could not be reached for comment. A phone number listed under his name came back as unavailable Tuesday evening. McGlockton had parked in a handicapped-parking spot outside a convenience store with Jacobs and their three children in the vehicle, he entered the store with their 5-year-old to buy some snacks, and when they were in the store Drejka confronted Jacobs about parking in that spot, authorities said. When McGlockton emerged from the store and saw the argument, he quickly shoved Drejka to the ground. Drejka, who has a licensed to carry a concealed weapon, pulled a handgun from his pocket and shot McGlockton, video of the deadly encounter shows. The video appears to show McGlockton, backing away before his was shot. "After he pushed him, the altercation was done," Rayner said. She said they are asking that charges be filed, and "if not, they're sanctioning a murder. Plain and simple." Another attorney representing Jacobs in a civil capacity, Benjamin Crump, said in an interview with NBC News that the shooting could have easily been avoided if Drejka had called police about the parking situation. "When you think about who the initial aggressor was here — it was this wannabe cop who should have called the police if he thought a crime was being committed," Crump said. “Yet he took the law into his own hands." Crump said he may file a wrongful-death suit to try and get compensatory damages for the mother and her children. He will also advocate that charges should be filed. At least 24 states have some form of law where there is no duty to retreat from an attacker, and at least nine of those states use the "stand your ground"-style language," according to the National Conference of State Legislatures. Under "stand your ground," Floridians have been able to justify using deadly force i n order to "prevent imminent death or great bodily harm." Florida goes the extra step of not requiring the gun owner to first try to flee from danger before pulling the trigger. Last year, Florida changed its law to put the burden of proof on prosecutors, the Tampa Bay Times reported. In 2012, Drejka was involved in an incident in which another driver complained that produced a handgun and hung it out the window during a road-rage incident, according to sheriff’s office documents. Drejka denied flashing a gun, but admitted to yelling at the driver of the other vehicle, according to the sheriff’s report. A handgun was found in the vehicle, but Drejka produced a concealed carry license, according to the report. The complaining driver in that case said he did not wish to press charges but did want to inform authorities, and the case was closed and classified as non-criminal, according to the report. Michael McGlockton, McGlockton’s father, said Tuesday that his son was a good man and a "gentle giant." "I raised him to be a man," the elder McGlockton said. "And unfortunately, it cost him his life."